“At night it is pulled to the Tunnel” – sounds the elfish gossip from the late 19th century. 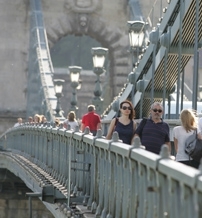 Chain Bridge, the first permanent bridge of Budapest was and still is a symbol of patriotism, advance and cohesion. For centuries, only temporary bridges, pontoons and ferries connected Buda and Pest. Industrial revolution and the fast advancing of the capital made it important to cross the Danube easier and safer. It was Count István Széchenyi, later often mentioned as “The Greatest Hungarian” who first came up with the idea of constructing a permanent bridge across the Danube. In December 1820 he received the news that his father had died in Vienna. Because of the hard winter the pontoon bridge was out of use. Stuck on the Pest side for a week, Count Széchenyi vowed that he would finance construction of a permanent bridge over the Danube, regardless of the costs. It took him almost 50 years to achieve it, as Hungarians were quite difficult to persuade about the necessity of a Danube bridge. Among other things, it was because the engineers had little experience in such huge constructions. Széchenyi was a well-educated and travelled man, deeply impressed by the English achievements of the industrial revolution. He not only got the best engineers and architects for the works, but managed to make a good propaganda for the constructions. Besides, he offered one-year income of his estates to finance the project. He commissioned William Clark, an English engineer to draft the plans of the bridge. The work itself however was led by the Scottish Adam Clark (no relations with William). 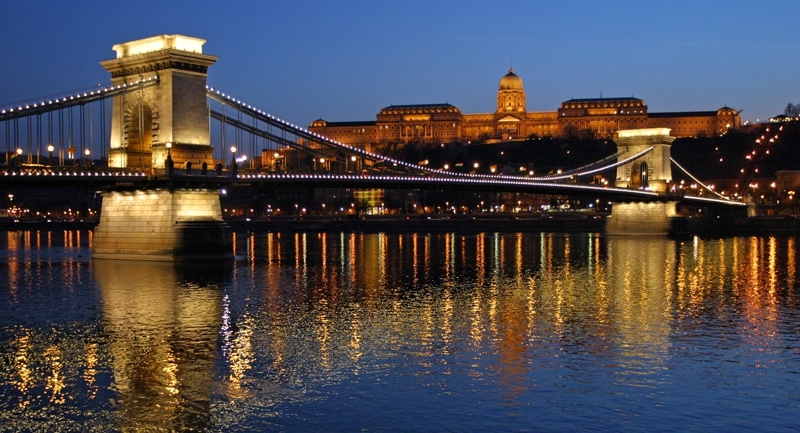 The Chain Bridge was finally inaugurated in 1849, in the second year of the freedom fights against the Habsburg Court. People used to joke that it was built so that the bridge could be dragged into the tunnel during the rain. 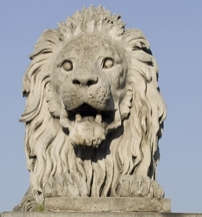 Perhaps the most well-known parts of the bridge are the stone lions guarding each end at the bridgeheads. These were designed by János Marschalko and local legend has it that the sculptor forgot the tongues and when this was pointed out by a little boy at the opening ceremony, he was so distraught, he committed suicide by jumping off the bridge. To tell the truth, the lions do have tongues, but they cannot be seen from the street level, though. The long history of the bridge is quite colorful. When the Austrian militia laid siege on the city Adam Clark flooded the chain-chambers and took the pumps apart to protect it from being blew up. A few months later 400 kilograms of gunpowder was exploded on the bridge, but the harm was repairable. Only a couple of weeks after the incident the Hungarian general, Dembinszky wanted to fire the frame of the bridge, but Clark stopped him. In 1914 a barge got loose from Margaret Island and hit the Bridge, breaking a line of chains. Many of the pieces fall into the river, and only 15 of them were found. Then, at World War II the bridge was blew up again and were reconstructed only in 1948. 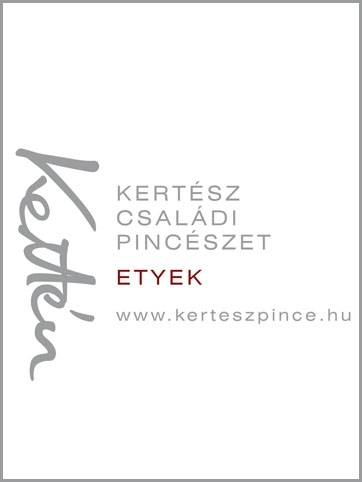 The 19th century is a special period in Hungarian History. At the beginning, the country was part of the Habsburg Empire, at the end Budapest played almost equal role as Wien, as the second centre of Austro-Hungarian monarchy. This is also a period of the so-called “reform-era”, time of the events which are still considered to be among the greatest examples of Hungarian Patriotism.